When you are trying to write a song, remember that balance is important. The simple chorus lyrics in Gordon Sumner’s “De-doo-doo-doo, de-da-da-da” allow the message of the verses to take center stage. If the entire song is the same, everything gets muddled and nothing shines. A death metal song probably isn’t about flowers. Pop songs generally rhyme, albeit often loosely. Pay attention to standards in your niche. Sometimes breaking the “rules” of songwriting helps a song stand out. If your normal style is a dozen instruments, lots of effects, an upbeat tempo, and five backup singers, a song with slower song with only three instruments and simple vocals will certainly make a difference fans notice. Take these risks when you really have something to say. Having trouble fitting the line about your “discarded heart being combustible” into your song? You might want to remember that above acronym and keep it simple. Try smaller words ending in common sounds and build from there. Also: sometimes those who say the least convey the most. You have the final say over what goes in your song, where it goes, and what your song says. If there’s an awkward line that’s hard to work with, take it out. If its poignancy completes the song, though, fight to keep it in. The songs are your stories; tell them the way you want them told. You’re not going to write the best song ever on the first go-around. You will have re-writes, and some things just won’t work. That’s okay. Don’t let obsessing over certain tricky song prevent you from writing other, potentially-better songs. It’s also okay to put lyrics down for a while; you can come back to them on another day or even another album. Don’t let writer’s block or a flop stop you. Write regularly, write when you’re inspired, write when you feel nothing. Keep a notebook with you to keep track of random thoughts to revisit later. Have any of the above tips helped you write a song? What tips can you offer other musicians who are writing song lyrics? Its great. It helps a lot. Thanks. These tips will surely helps a lot in writing. I have a friend who really wants to write his own songs. 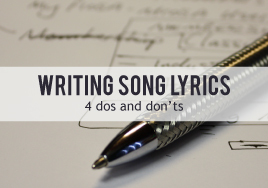 Thank you for listing all the do’s and don’ts of writing lyrics. I really like how you mentioned that breaking the “rules” of songwriting can help a song stand out. I think it would be good to try and not follow too many rules when trying to write a song.